Ansonia Clock Co. Royal Bonn porcelain case, "Dresden Extra", ca 1895-1905. There is a large stamp, or label, on the back that says, "Manufactured Expressly For the American Wringer Co. New York, No.1667". There is a small chip on the base, in back, that may just be a firing imperfection. Case is 13 1/2 inches wide, 12 1/2 inches high. Green tints, roses and other flowers on all sides, and gold striping. 8 day, half hour gong strike, is running. 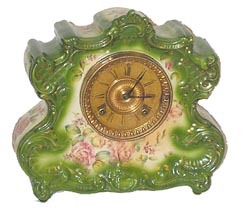 Pendulum and back door correct.Typical Ansonia porcelain clock but not a model they made to sell from their catalogs. For an excellent report of this clock and the American Wringer Co., refer to the NAWCC Bulletin No. 243, page 331, August 1986.